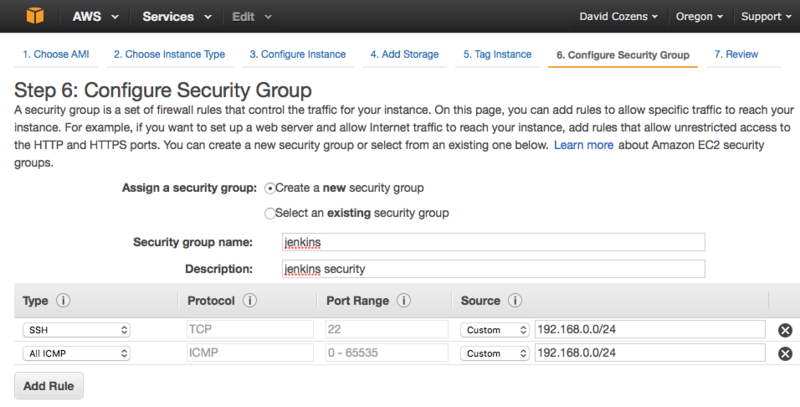 I wanted to extend my home network to a Virtual Private Cloud (VPC) within Amazon Web Services (AWS), primarily for use as a jenkins build farm. I have achieved this using a Raspberry Pi as my Customer Gateway device. This post covers the process of configuring the raspberry pi from scratch and AWS from scratch. I'm posting as a reminder to myself, hopefully others will find this useful. I have a fairly standard home network on 192.168.0/24 with a router provided by my ISP. This post uses a Raspberry Pi, on a static IP address within my home network as a VPN gateway. 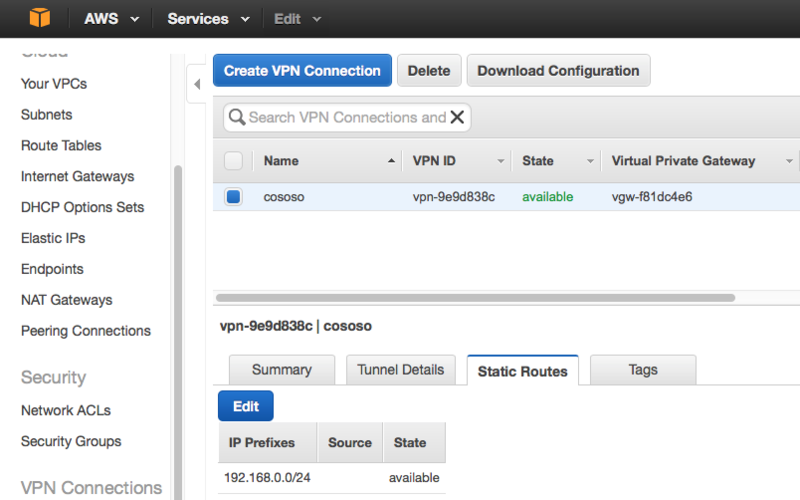 Allowing any devices on my home network to communicate with EC2 instances (virtual machines), running within my VPC. Home gateway IP address of you home network is static (My ISP doesn't offer static IP addresses, however the address has not changed for years). AWS account (I suggest also running some tutorials, the free tier is sufficient). I'm starting with a clean install of Raspbian Jessie Lite, although other distributions of Linux should work. 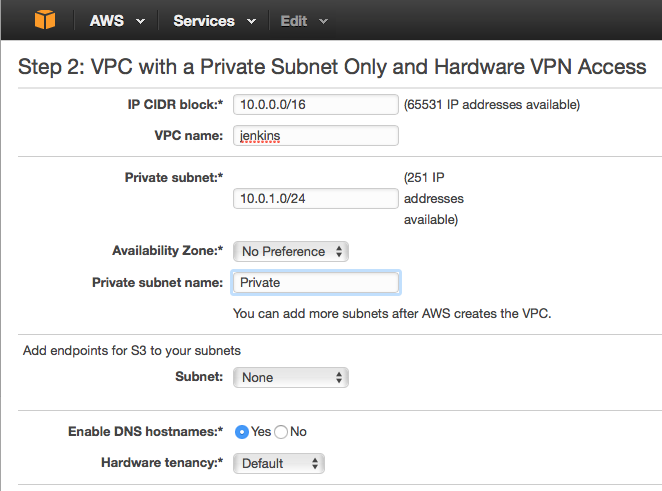 Choose VPC with a Private Subnet Only and Hardware VPN access and click Select. You will need the <TUNNEL1_IP> and <PSKEY_STRING> values later, note them down. 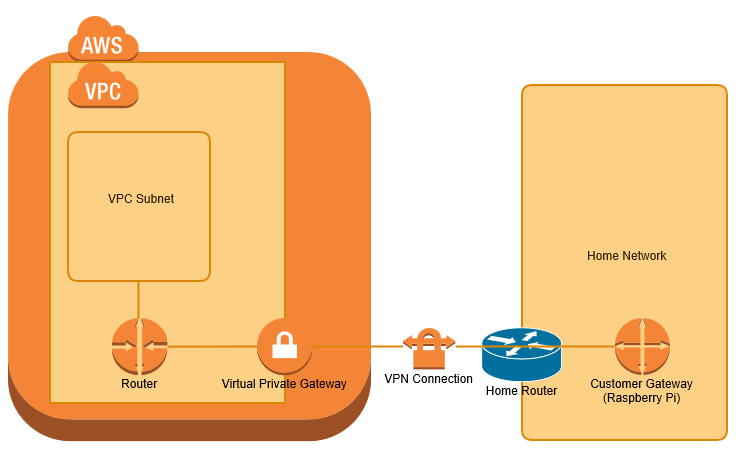 Ensure that the static route to your home network exists in the VPN, Opne VPN Connections and select the Static Routes tab, it should show the CIDR for your home network. If not (my setup didn't) click Edit and type in the CIDR. During package installation you get prompted about using X.509 certificates. I'm sure AWS supports these, for now I'm skipping for simplicity. Edit /etc/ipsec.conf and set the content as shown below. NOTE this is including configuration files from /etc/ipsec.c/*.conf, this allows different files for different connections. 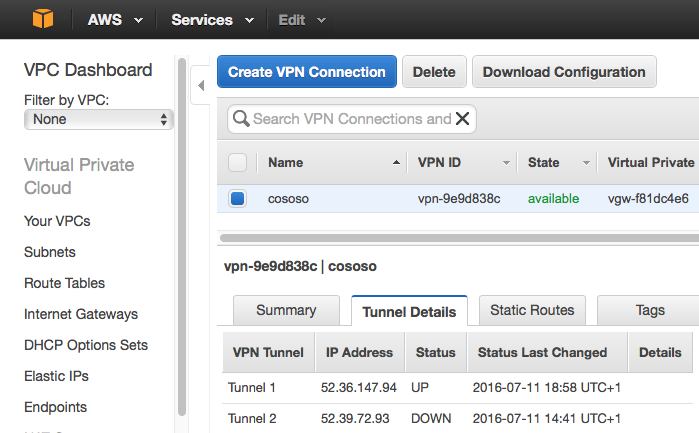 right - the IP address of Tunnel1 in your AWS gateway. 123.123.123.123 <TUNNEL1_IP> : PSK "<PSKEY_STRING>"
Then run sysctl -p to reload it. 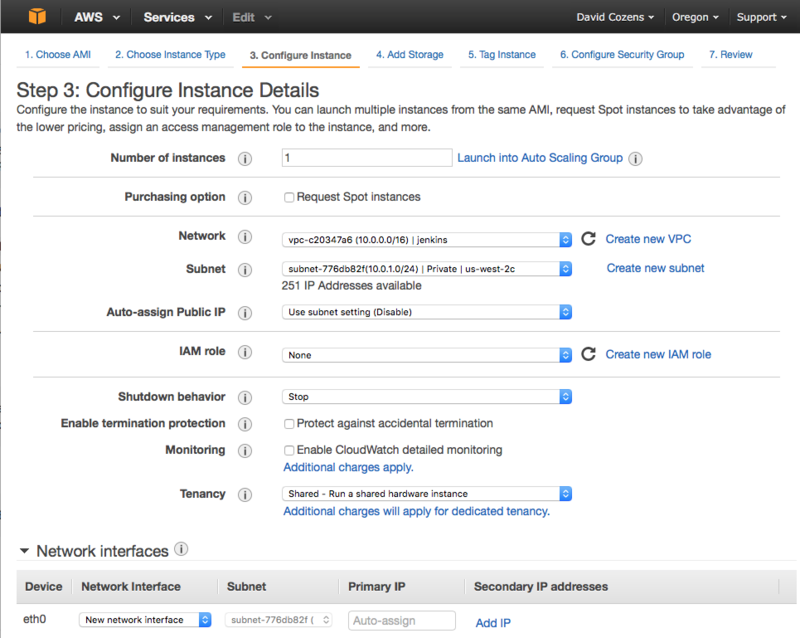 To test the configuration Launch an EC2 instance into your VPC. As an example I'm launching the free tier Ubuntu server. From the EC2 Dashboard select Launch Instance, select Ubuntu Server 14.04 LTS (HVM), SSD Volume Type, select t2.micro (Free Tier Eligible) then click Next: Configure Instance Details. 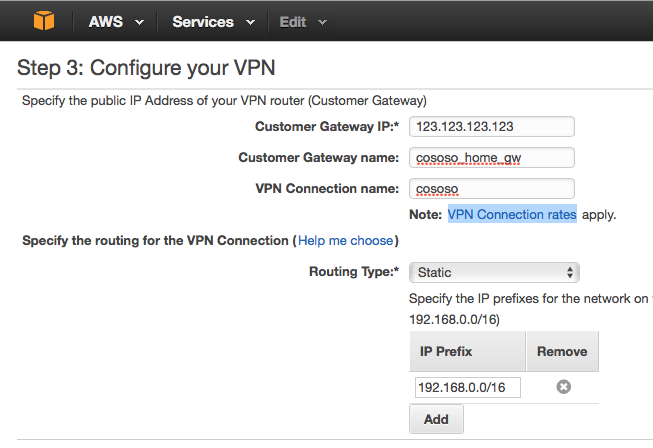 Select your VPC as the Network. Click Next: Add Storage, Next: Tag Instance, Next: Configure Security Group, Create a new security group and add the rules you require, the example below adds SSH and ICMP (ping) from my home subnet. Click Review and Launch, Launch, create a new key-pair (or use existing if you prefer), Download the Key Pair and keep them safe. Launch and then View Instance. Wait for the Status Checks to complete. PING 10.0.1.19 (10.0.1.19) 56(84) bytes of data. Devices on your home network that are to access the VPC need to have a static route added that identifies the Raspberry Pi as the gateway to use for 10.0.0.0/16. copy the key file that you previously downloaded to the machine you want to open an ssh session from. Ensure the pen file has read only permissions. All being well you are now logged in to your EC2 instance. Posted in Raspberry Pi and tagged aws, RaspberryPi. Thank you, I’ve corrected the typos. I hope it works well for you. I had to apply this fix for missing newlines !? !